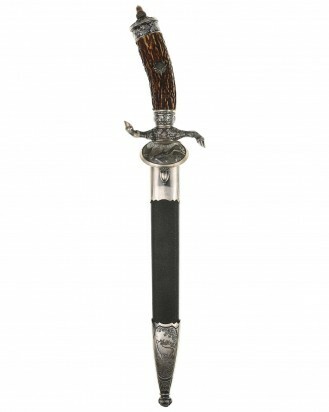 Deluxe Hunting Cutlass by Original Eickhorn Solingen. This triple engraved cutlass shows minor aging to the blade as pictures show. Retains original green felt washer. Exterior is in mint condition, the fittings all retain almost all of their lacquer with the exception of some wear to the cross guard. Has beautiful stag grip handle with a superior depth that gives it a lot of character. Beautiful piece.